Eddy-current Brakes provide frictionless stopping power in heavy industrial and transportation applications. While the application in the German rail system is widespread, adoption globally has been slow. Though Eddy-current technology has great advantages, the lower adoption means in can be difficult to find reliable suppliers of Eddy-current brakes, controllers, parts and repair service. Fortunately, Kor-Pak can provide the expertise you need to find, install and maintain Eddy-current brakes. Traditional braking mechanisms apply force with physical contact, pressing friction material against a disc or drum surface, which are attached to a rotating axis. With Eddy-current brakes, no direct, physical contact is made. 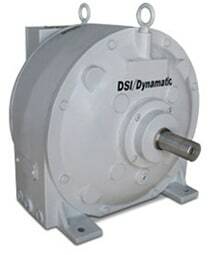 Instead, an Eddy-motor is used to create electromagnetic currents which apply magnetic force against the rotating disc, creating drag, and slowing its speed. Thus, Eddy-current brakes are frictionless. 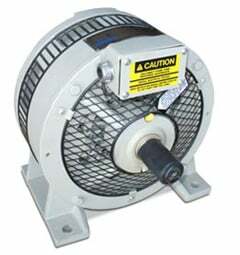 While there is no direct contact friction, Eddy-motors do generate heat. Kor-Pak Eddy-current brake offerings include air cooled and water cooled brakes. Talk to a Kor-Pak representative to ensure you receive the proper design and cooling mechanism. With the acquisition of Stromag, Altra Industries is discontinuing sales and service of the Eddy-current brakes by Stromag. Kor-Pak’s experience with Stromag and Eddy-current brakes allows us to continue support for these brakes, and if necessary find our customers an appropriate replacement. Stromag’s products are good quality and we expect them to last a long time with proper maintenance.